Varonis Systems was a young, venture-backed company that provided a unique data security software platform, helping organizations prevent data breaches, thwart cyber attacks, reduce risk, and achieve regulatory compliance. Knowing they were headed toward an IPO and needing to raise their profile, they asked CTP to help build awareness and prepare them for their close-up.  Varonis uses big-data analytics and machine learning to inoculate its customers against major damage from cyber attacks. Unfortunately, no one outside their customers really knew who Varonis was, and they weren’t finding ways to stand out. We were tasked with elevating awareness of the company among a crowded field, and making them central to the data breach/security discussion. We helped put Varonis on the map with an ambitious PR and thought-leadership program. We worked with the company to sharpen its story and capitalize on some themes that were getting a lot of attention not only from IT executives, but also from Wall Street: cyber-attacks, security breaches and big data. We devised and implemented a pre-IPO communications strategy, relying on our deep experience with the business and financial news media and the nuances of SEC regulations. Employee engagement is critical for a company in hyper-growth mode. We worked directly with co-founder and CEO Yaki Faitelson to craft messages for the growing employee population, keeping them informed of new developments and motivating them for the road ahead. We also managed intensive on-camera media training for the CEO and his senior team. Our three decades of experience working with prominent tech CEOs enabled these sessions to be authentic and effective. We proposed and ran a mock earnings announcement process to simulate the real thing, with deadlines, news release drafts and tough Q&A sessions. The efforts paid off. A Forbes column told the Varonis story more clearly than anything previously published, and one expert opinion built on another. 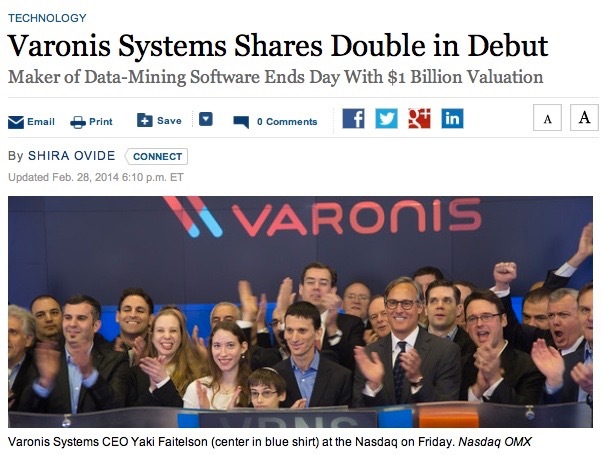 Varonis had a wildly successful IPO. 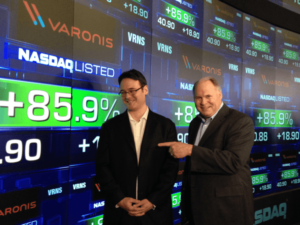 In its first day of trading on Nasdaq as VRNS, Varonis doubled its opening price and closed with a $1 billion valuation. The long process of cultivating media awareness was rewarded with high-profile headlines and social media buzz. The efforts paid off. 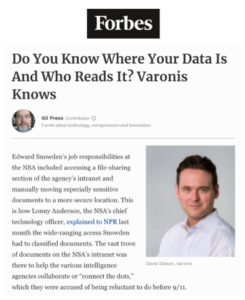 A Forbes column told the Varonis story more clearly than anything previously published: (“Do You Know Where Your Data Is And Who Reads It? Varonis Knows”, and one expert opinion built on another. Find out how we can do something similar for your brand. Learn about our experience building other technology brands.